There were so many wonderful phases of this rapidly changing sunset, that I couldn’t cull out any more than I have. I am perhaps excessive, but this sunset certainly was as well, so I feel I’m justified. If you click on the first photo, it will enlarge them all. 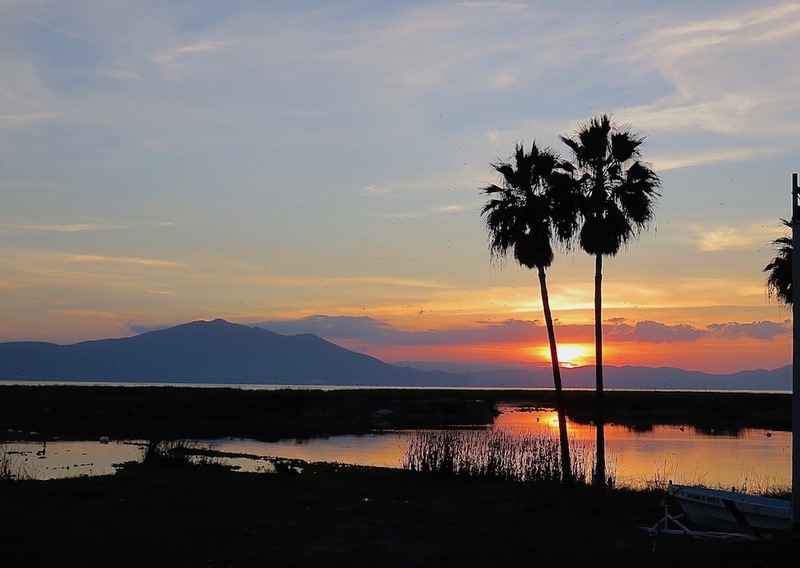 This entry was posted in Images of Mexico, Lake Chapala and tagged image of Lake Chapala, images of sunsets, Lake Chapala, photograph of Lake Chapala, Sunsets on September 21, 2018 by lifelessons. They gather in circles as the day ends. Men sit in one circle, closer to the lake. Women, still standing, cluster laughing around a ribald tale. They’ve been cutting old willow, then burning it for weeks to clear the mud flats. Now new willow, red-veined with opalescent skin, springs up from the graves of the old. The teeth of slender leaves cup up to catch the far-off whirr of rain bugs in the hills. as the temperature, which grows hotter every day. swallows in frenzied swooping snarls. that in the past few weeks has sprung from the cracked mud. sees the ones from her pueblo who burn off last year’s growth. Sees also the gringa who cuts the tender willow. is watched—the bright colors of her clothes drawing eyes. Now and then, all flock here. toward her car far up the beach. and the other willow cutters circle longer, telling stories, moving slow. This is a poem written the year I moved to Lake Chapala, sixteen years ago. Every day for two years, I walked on land that had formerly been lake. There were acres of willow that I later learned townspeople were hired to clear before Semana Santa, when hordes of tourists from Guadalajara always descended. I was there to cut willow to make lamps. When the lake came up to its former banks a few years later, all of those willows, that grew back yearly, were destroyed. Only their bones now stick up when the lake recedes a bit again every year. They make perfect roosting places for birds. I rarely walk on the lakeside anymore. The lake has remained high enough so all of my former walking places are under water. Instead, I stay home and write poems and post blogs. As usual, click on any photo to enlarge all. This entry was posted in Judy Dykstra-Brown poems, Poem and tagged gringo, image of night heron, images of egrets, Lake Chapala, Mexico, Mexico Images, Willlow, willows on January 8, 2018 by lifelessons.